The 1887 N184 W. S. Kimball Champions Set contains 50 unnumbered cards measuring 1 1/2" x 2 3/4". The N184 cards resemble the Allen & Ginter cards. The Kimball Champions set features a portrait of the player on the top front of the card, with an action shot on the bottom half. 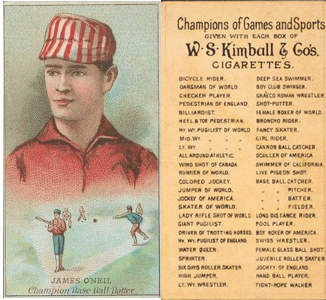 Card backs read: "Champions of Games and Sports Given With Each Box of W S Kimball & Co's Cigarettes". True to other "Champions" sets of the 19th century, the issue is comprised of athletes from various sports. Only 4 baseball cards were produced for this issue: N184 Kimball Champions Tip O'Neill, Dell Darling, E.A. Burch and Hardie Henderson. Also notable from this set is the Isaac Murphy, an African-American jockey that won three Kentucky Derbies! CLICK HERE if you want to sell your 1887 N184 W.S. Kimball Champions Cards.